Off to New Brunswick we went to try a new place for lunch. The George Street Ale House just opened its doors in January. They have a nice selection of craft beer on tap and even more in bottles. I figured why not have a nice pint and a burger to end the first quarter of my quest to drink 365. 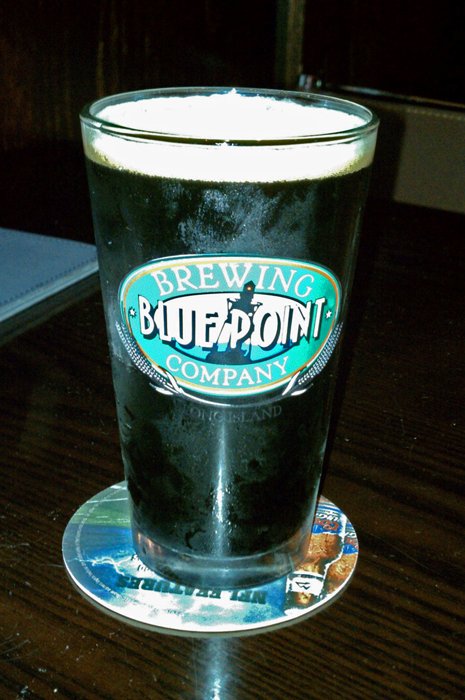 Beer #91 is Oatmeal Stout by Blue Point Brewing Company. This beer is an Oatmeal Stout with an ABV of 4.5% that is brewed on Long Island in the great state of New York, the Empire State. The waitress delivered the beer to me in a Blue Point pint glass. The stout was dark, almost black but not quite. The head was small and tan and it left some nice residue on the glass as I drank it. I took a whiff, the nose was very muted. I could pick out some roasted malts and a bit of chocolate but that was about it. I took a swig and was disappointed. It had a very light coffee taste with just a bit of sweet roasted malts and not much of anything else. I didn’t pick up the oatmeal or any of the chocolate I got in the nose. The mouthfeel was light and watery with very little in the way of carbonation. It was easy to drink but I wasn’t hankering for another. This was an average Oatmeal Stout at best. Breakfast Stout by Founders is a much, much better beer of this style. This was a disappointing way to finish off the first quarter of my 365. The food on the other hand was very good. Hopslam by Bell's Brewery, Inc.
Quick note, if you get the chance, check out the movie 127 Hours. I saw it last night and thought it was fantastic. The story is truly inspirational. 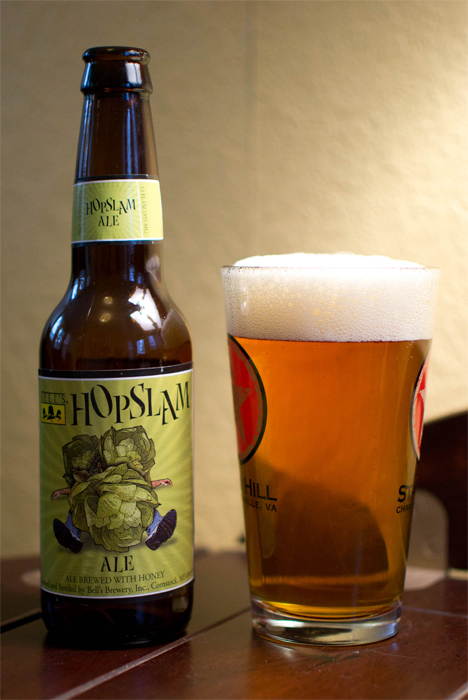 Beer #90 is Hopslam by Bell’s Brewery, Inc. From Michigan by the way of fellow blogger Scot, http://blog.twobeerdudes.com, comes this American Double/Imperial IPA. The ABV of this DIPA clocks in at 10%. The color was a slightly hazy copper with a nice two finger width foamy white head. That head left some excellent lacing in my pint glass. The aromas I got from opening the bottle made me smile. There was some nice grapefruit, pine, a bit of lemon, & floral aromas along with something sweet. After reading the label, I think the sweetness comes from the honey. The bitter hops kick in first in the taste followed by the grapefruit/lemon flavors with a nice bitter hoppy bite at the end. There was a slightly sweet taste going on in here also. 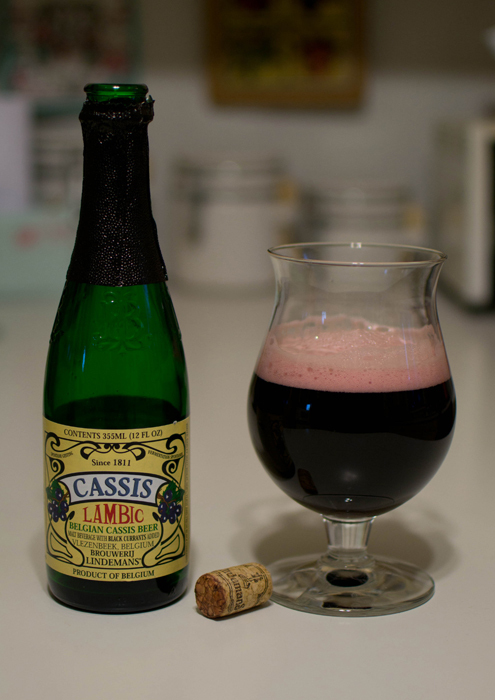 It had a nice medium body with some nice carbonation that sort of coated the tongue. The 10% ABV was hidden really well but it will bite you if you enjoy this too quickly. Delicious…this was right up my alley. DIPA FTW. Good stuff from Bell’s…enjoy it if you can get a hold of it. Beer #89 comes to me from Maryland. 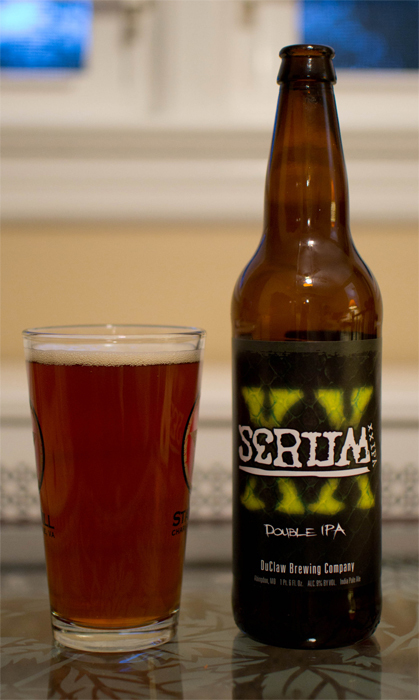 Serum by DuClaw Brewing Company is an American Double/Imperial IPA. This is one of my favorite styles of beer. The ABV of this one is 9%. DuClaw has a nice brewpub in Bel Air, MD with excellent food. I had the pleasure of visiting that location a few months ago. 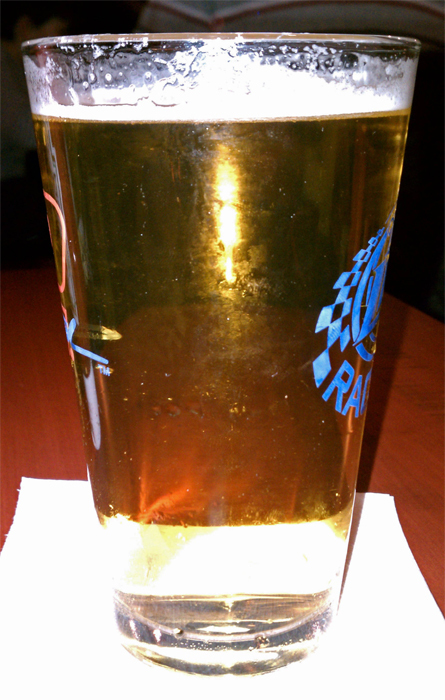 A reddish amber color with a small white head stared back at me from the pint glass. There were a bunch of bubbles trying to escape only to get trapped in the head. The nose was kind of faint but was typical for a double IPA (pine, citrus) but heavier on the caramel malty sweetness. That malty sweetness hits you up front followed by the grapefruit/pine hop flavors and finishes slightly bitter with a bit of booze. The bitterness that lingered on in the aftertaste is quite pleasant, at least for me. This smooth brew was slightly heavy bordering on syrupy and not overly carbonated. A very nice beer to drink but the 9% ABV started to make itself known towards the end of the bomber. I had this on tap when I visited DuClaw and it is pretty much how I remembered it. I enjoyed this and would get this again preferably with DuClaws fried green tomatoes and buffalo chicken tenders, the hotter the better. Tonights beer was what I had ready for yesterday…will it surpass Stella? I really don’t see how it couldn’t. 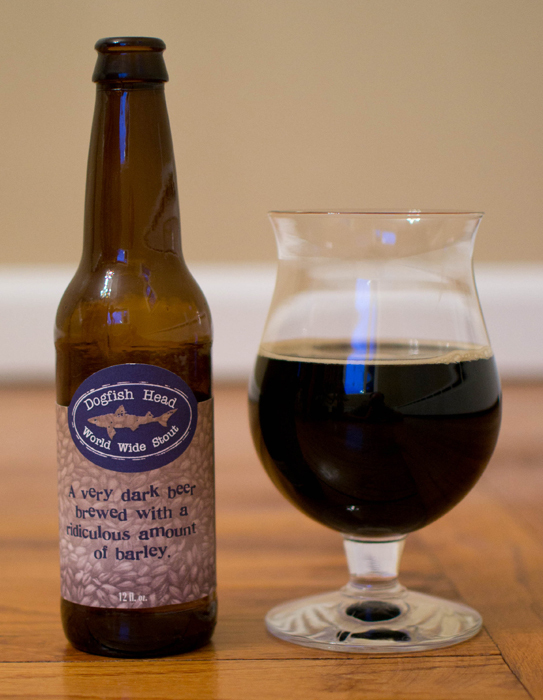 Beer #88 is World Wide Stout by Dogfish Head. Get this, this American Double/Imperial Stout has an ABV of 18%. You read that correctly…18%. Going to be a fun time in the old home tonight! This stuff was pitch black, even when held up to the light. There was the tiniest of tan heads and a tan ring of foam that lasted the whole drink. The scent of alcohol was very strong with this one young grasshopper. Boozy, malty, a bit of chocolate, and more booze make up the aroma in this brew and the alcohol scent got stronger as it warmed up. And warmed up it became because it was a super slow sipping drink for me. I got a bit of chocolate and lots of sweetness in the taste but that alcohol kept rearing its ugly head. There was a warming alcohol finish to it and a slight chocolate aftertaste that lingered. Mouthfeel was not as heavy or syrupy as I was expecting from the appearance but it had a ton of carbonation bordering on fizzy. I had to take my time with this, mostly because of the super high, here it is again, alcohol content. I wasn’t a big fan of this. The alcohol was too overpowering for me so much so that on an empty stomach, I was feeling the effects of the ABV fairly quickly. So far it is the worst Dogfish Head beer I have had. It seems to get rated very high…I don’t know…maybe it was just me or I wasn’t in the mood for this but I think if I was offered another I would pass. I do know if you drink this too fast, you will pass…out that is.